Fixed Wireless Internet in your area. Fixed wireless internet connections are not too familiar by most of us. This technology is often confused with Satellite internet. The main difference being that fixed wireless transmits data through radio waves using a fixed wireless tower. This type of internet connection will require a dish or an antenna, but is not as affected by the weather as Satellite technology is. The signal covers a shorter range so the weather elsewhere would not really affect the signal transmissions. 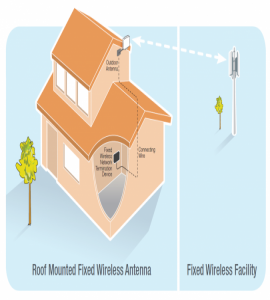 Fixed wireless towers are land-based about the same dimensions as a cell phone tower. With a fixed wireless connection, the signal only travels about 10 miles, going from the antenna to the closest tower. This creates lower latency than Satellite internet for example. In this case, the shorter the travel distance, the better service. Fixed wireless latency can be compared to a cable or DSL connection as the service will run almost as quickly. Fixed wireless will not so much be affected by the weather that is outside a certain radius. Fixed wireless will offer a good speed and most providers will not have data caps for their internet service. This technology usually will covers a large area and is readily accessible. The installation usually requires a certain landscape that allows the antenna a straight line of sight for the service to work. There should be no hills or obstructions. A fixed wireless connection will not support any data roaming since it is tied to one specific access point. Depending on your area, the cost per Mbps (cost for the internet speed) is generally higher than other technologies.